The Turning Point: Toothpaste Dispenser ? Really ?? 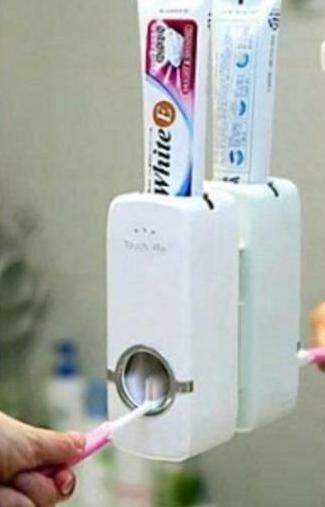 Toothpaste Dispenser ? Really ?? When was the last time you gave a thought on putting the right amount of toothpaste on your tooth brush ? Have you ever been really worried that you may put more toothpaste than is needed or that you would get the amount all wrong ? well you need not worry any more ! It seems there is a “smart” gadget that can help you get just that "right" amount of toothpaste on your tooth brush !! Yes, I'm talking about the toothpaste dispenser. Another piece of annoying technology that for me tops the list of useless gadgets. I sit here and wonder, why would a company, any company, ask their employees to use their precious creativity and innovative talent to design a gadget that makes absolutely no sense ? Maybe they felt that squeezing a toothpaste tube is, presumably, a lot of hard work and they wanted to do away with that task ? Or maybe the act of picking up the lid if/when it falls is very tiring ? Oh wait...now you don't have to worry about your spouse or child squeezing the tube at the center !! That way there will be less morning fights and divorce rates will go down and harmony amidst parents and children will be restored and life will be more peaceful !! Really ? Do we really need a toothpaste dispenser ? This in my view is the new level of craziness and lazy.